Bitcoin is heading towards a regulated path now that the Chicago Exchange launched the futures contract that follows the wildly volatile bitcoin price. In January, a bitcoin was trading for 926 US dollars and now the actual price is at 16,730, and there is not much until the price will hit a 2000% gain since the start of the week. Trading bitcoin online in a more regulated environment is now much easier due to the launching of the bitcoin futures contracts on CBOE. 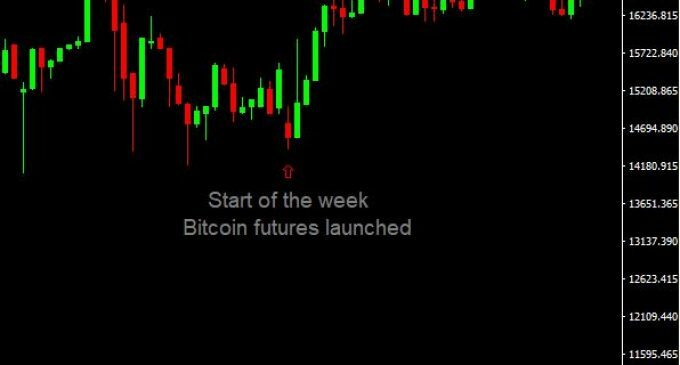 December 11th, 2017 marked the start of a new stage for bitcoin and it was a big day since the futures went up by more than 20%. The exchange even had to suspend the session, when the price hit a 10% increase and a 20% increase, for a few minutes. Even though at the end of last week, on 8th of December, the bitcoin price fell by 1,800 US dollars, top tick to bottom tick, the futures launching gave a new boost to the price as it can be seen in the chart below. The bitcoin price managed to recover all the Friday losses and even made a new record high, reaching the staggering 17368 milestone. Trading bitcoin online had been hot in the second part of the year, as the price had been trading upwards impulsively, even though various analysts and important officials had claimed that bitcoin is a bubble that is about to burst. Despite that, the price had continued to trend higher, reaching unprecedented levels that left people speechless. Low liquidity had made that possible. The total market value of bitcoin is currently at $150B, which is not very much if we make a comparison with the forex or stock market. However, due to that low liquidity, wild swings had been seen in the last few month, the price dropping by more than 25% in just a few days. Even though the performance of bitcoin had been impressive, the price swings made it very hard to trade. Buy and hold is by far the worse strategy one can adopt, in order to generate profits from the bitcoin price fluctuations. The question remains how far the price will manage to go since there is still no sign of weakening and the end of the year will catch the digital currency with the best monthly performance in history. Trading crypto currencies on margin carries a high level of risk, and may not be suitable for all investors. The high degree of leverage can work against you as well as for you. Before deciding to invest in crypto currencies you should carefully consider your investment objectives, level of experience, and risk appetite. No information or opinion contained on this site should be taken as a solicitation or offer to buy or sell any currency, equity or other financial instruments or services. Past performance is no indication or guarantee of future performance.